Quote attributed to General George H. Thomas at council of war held in the late of night on December 31st, 1862. Purportedly uttered in support of staying and fighting despite the rough handling the army was given by the confederates that day. It must have been fate. In the airport waiting for my flight and without Internet I was working on this entry, a little thought running through my head that I should copy the text to the note pad as I wasn’t entirely sure that the iPad app would work that well in offline mode. So I finish the entry and then attempt to upload a photo. Stupid. Further I hit cancel thinking I was canceling the photo upload and not the whole entry. Stupid x2. Gone baby gone. It was either genius unrealized or it saved me a lawsuit. Either way it is lost in the ether. On Thursday of this week we traveled to the Stone’s River battlefield in Murfreesboro, Tn. It was sobering. Not just because it is hallowed ground but because so little of it has been saved for posterity. Key positions in the center and Union left flank are preserved, but the vast majority of the Confederate right where the fighting took place has been forever lost. Further, aside from then civil war’s oldest monument, the Hazen brigade monument in Hell’s Half Acre and a few artillery emplacements that have been labeled, the battlefield is bereft of markers. There are park markers giving the history of the specific location and there are plenty of cannon about, but they are unmarked as to what battery they might have been. There are some key locations near the Union center (what had been before the confederate attacks forced the Union right to collapse) like the Knoll, an area of high ground astride the Nashville Turnpike where fleeing remnants of Rosecrans’ right flank brigades fled to as the confederate attacks of Hardee’s then Polk’s Corps drove deep into the union lines, through thick woods and came out of the trees to face Sheridan’s division and whatever union brigades that could be rallied. Repeated attacks upon this position on the first day were unable to force their way to the turnpike. Here the Chicago Board of Trade Battery deployed on the rise and fired into advancing confederates of Cheatham’s division. Batteries deployed beyond the turnpike in what is now the national cemetery blunted the confederate attacks here and along the Cotton Field. Pictures cannot do the Slaughter Pen justice, however. In a heavily wooded area, Sheridan’s division found themselves beset by Polk’s attacks. The whole area is strewn with glacially deposited rocks, rocks whose surface was worn smooth by years of constant grating and deposited in parallel lines, not unlike a natural trench work of rock. Here Union soldiers lay and fought, taking cover in these formations and dying by the score, so much so that the place was likened to the slaughter houses of Chicago by then Illinois troops who fought there, the pens becoming a pen for the slaughter. 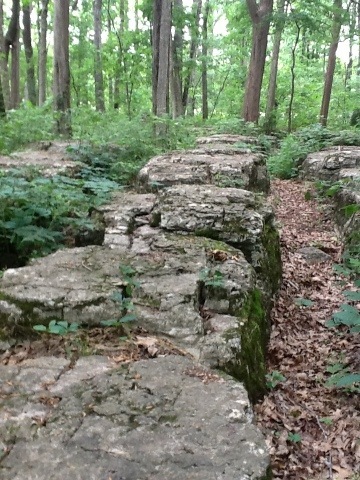 The ground is uneven and broken by these rocks making any movement difficult. 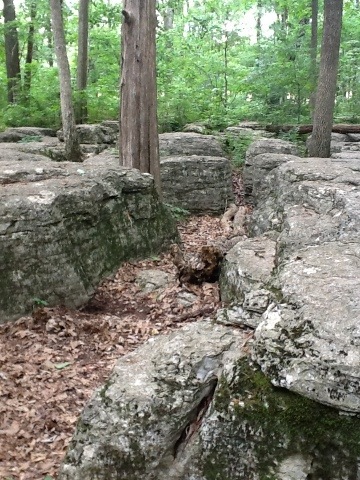 Rocks like this are all over the ground here and some as big as a man. Hell’s Half Acre is hard to visualize as the Round Forest is now gone and but for the Hazen Memorial it would not be recognizable. The field just across the Nashville Turnpike and just up against the Chattanooga and Nashville Rail Road line and the facing of the canon at the sight give the direction that the brigade defended against as attacks came from two sides as the Confederates made both for the road and for the rail line, cutting both would have been disastrous for Rosecrans. Hazen’s brigade of Sheridan’s division would be the only part of the original Union line to not bend under the attacks by Polk’s brigades. I did not make it around to all of the markers and walk all the trails, but the last part that has been preserved is the Union held McFadden farm and ford where the last day’s action took place. The confederate positions are all gone, hidden under asphalt and concrete where Breckenridge’s Orphan Brigade were cut to pieces as they punched through the Union positions on the opposite bank and tried to cross the ford and attack the opposite heights. 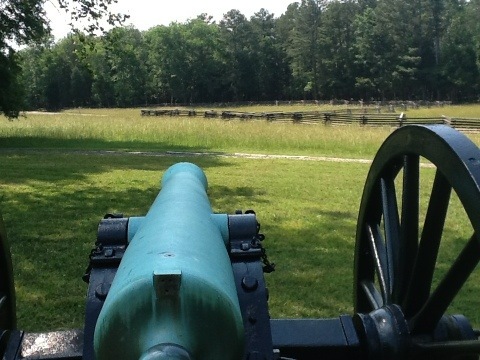 There is a set of canon on the Union side of the ford marking the line of Mendenhall’s 58 guns that were instrumental in breaking up the attack. The vista is broke by trees that are growing up from the river bank that obscure the opposite heights on the Confederate side of the river, but it is just as well since the view is of a freeway turnoff and other modern development. If you are like me, you have to read every marker. Stone’s River is an easy read if you have time to walk the trails. I had high hopes of locating positions and monuments for note taking and in that regard was disappointed. I did get good notes for the 4th novel which will center on Stone’s River and walked the ground so tenaciously fought over by both sides. The battle was an attempt by both sides to attacks each other’s right flanks. As it turned out the Confederate attack hits a weak point as Rosecrans has his left built up and his own right is unprepared. Rosecrans abandons his own attack and the Confederates crush his right so successfully that the whole battle hangs in the balance as Bragg’s attacking divisions fight their way through the thick woods. The battle will end with confederates entrenched in front of the Cotton Field and pulled back from the Knoll. Fighting shifts to other parts of the field inconclusively and there is a rare lull in the fighting as a day passes before Bragg decides to hit Rosecran’s left flank (the McFadden farm) and sends Breckenridge’s division into the meat grinder and the battle ends.